However, data center heat reclamation si clearly a problem well worth solving since just about 100% of the power that enters each facility is released as heat into the environment. Ironically, not only is almost all the power that comes into the data center released to the environment as heat energy but, a considerable amount of energy is actually expended getting rid of this energy. The cooling plant, pumps, fans, water towers, etc. all take more power with their only contribution being to effectively remove all the power that we just finished buying. Many ways have been proposed to greatly reduce the cost of datacenter cooling including the elimination of process-based cooling. A great example of this is the Facebook Mechanical System Design. This is good work that I still like today because it’s getting the cost of cooling down closer to zero. Similar approaches using water rather than air as the heat transport media can be even more efficient. For example, the Deep Green Datacenter near Zurich that uses cold water from a lack to cool the facility (46MW with Water Cooling at a PUE of 1.10). These systems get rid of the waste heat efficiently. But, returning to waste heat reclamation, what about actually using the heat released from a data center rather than attempting to discard it at very low cost? Great effort has been expended attempting to generate power from the low grade waste heat from a data center but this hasn’t yield great results thus far. What has been effective is using the heat in another useful process. In the past, I’ve proposed the use of data center waste heat in the growing of high value crops like Tomatoes in climates ordinarily too cool for this crop. Another example of data center heat reclamation I recently pointed out was a proposal to use the heat from a datacenter to heat sea water prior to entry into a desalination plant. This increases the efficiency of the desalination plant while providing near free cooling for the data center (Data Center Cooling Done Differently). 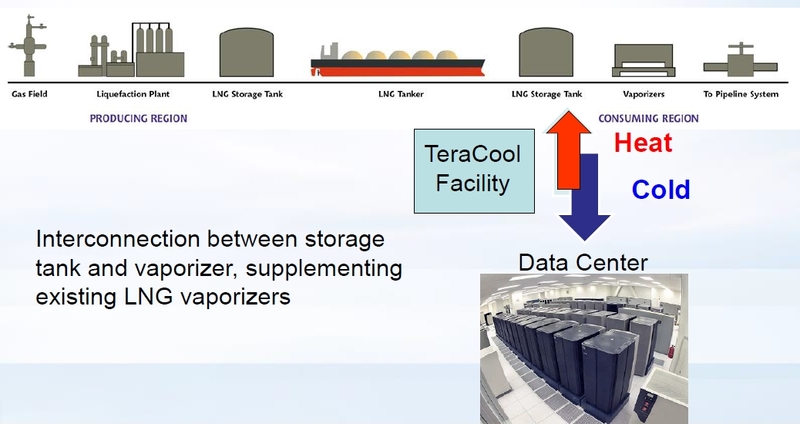 Yet, another approach I recently came across that appears to have potential was a proposal by Teracool to use datacenter waste heat as part of the heating process in Liquid Petroleum Gas vaporization. 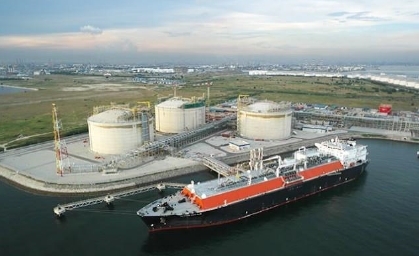 LNG is seeing rapid increase of use in world energy markets driven by it being much cleaner than coal and it is available in large quantity driven by hydraulic fracking. LNG, like all petroleum products is often shipped via large sea-going cargo ships. But, unlike petroleum, LPG is delivered for consumption in gaseous form although it is shipped in its liquid state. To liquefy it prior to shipment, it must be cooled to below -260F which, of course, requires considerable energy. On the delivery side, the liquid must be heated to return the product to its gaseous form. Ironically, this again requires considerable energy. In fact, some vaporization plants consume as much as 1.75% of the product in vaporization. What Teracool proposes is using this cold (absence of heat) to cool data centers. 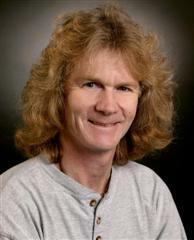 Going a bit further, they propose the waste heat from the data center to drive vaporization and then, as the product expands 600x from liquid state to gaseous state, use the power of expansion to drive gas turbines to generate power further reducing the energy loss and supplying at least part of the data center power requirements. Research in the data center world has swung from doing excellent work in getting rid of waste heat to focusing on recovering this vast store of energy. I expect we are going to be seeing many interesting examples of how data centers can be run more efficiently by harvesting the energy released by the operation of the data center. Joseph said "Future chips will also play a role in the energy consumpiton of data centers." Absolutely, technology innovations from semiconductor, through server and storage designn, to power distribution and cooling are playing a huge part in reducing data center power consumpiton. And, perhaps most important, the utilization levels made possible by cloud computing can triple the useful work to energy ratio. Gerardo asks: "Can I use your content to translate into Spanish — I"m opening a new blog on data center for the spanish speaking commmunity". Sure, as long as you link the content clearly back to //perspectives.mvdirona.com, that’s fine. Can I use your content to translate into spanish? I am opening a new blog for Data Center and the spanish speaking community. Thanks for the update on Densitas (previously Deep Green) Simon. Note that Deep Green have changed their name to Densitas (http://densitas.ch/). There were some trademark issues with two other Swiss companies called Green and Deep (no kidding), who are active in the hosting/datacenter space. Densitas seems to be operational, though I’m not sure how much of the ambitious plans for efficient cooling were actually implemented.